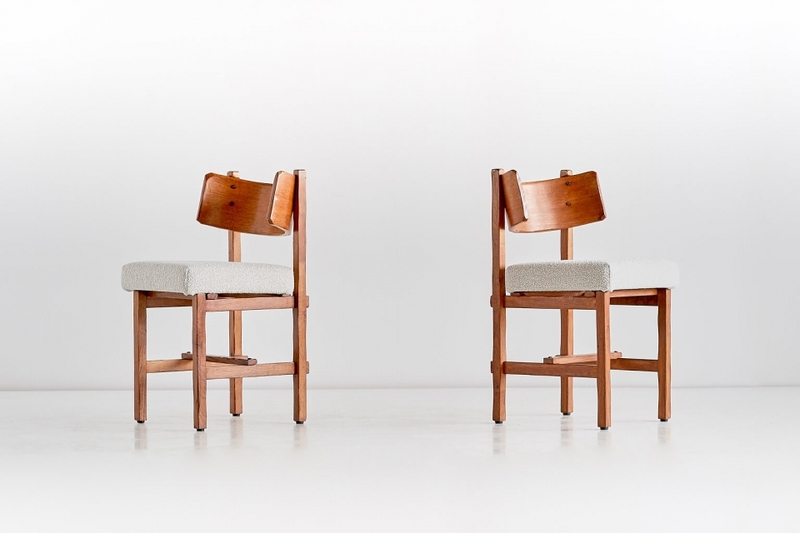 This rare set of dining chairs was designed and produced by the Belgian designer Simon Packo in his own workshop in Blankenberge in 1972. The handcrafted chairs in solid oak are characterized by their curved backrests, striking frames and several sculpted/carved details. The wood displays a beautiful patina. The seats have been fully reconditioned and newly upholstered in an elegant ivory / off-white fabric by Lelièvre Paris. A sample of the fabric is available on request, please enquire for details. The chairs have been marked with a date, branded and labeled. 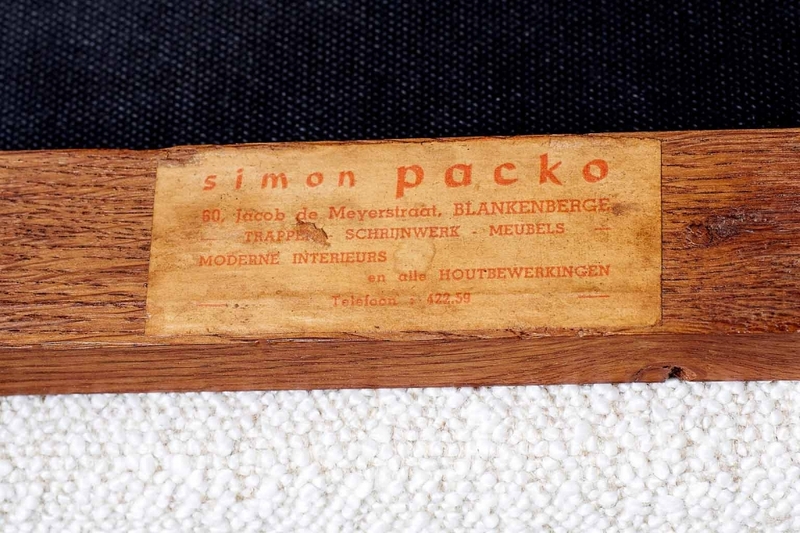 In 1952 Simon Packo (1925-2004) opened his atelier in the upscale coastal town of Blankenberge, Belgium. Packo designed all furniture pieces himself. They were exclusively made to order and manufactured by hand on site in his workshop. He also designed stairwells and complete interiors for both private clients and public / hospitality projects in Knokke, Oostende, Zeebrugge and Blankenberge. Packo’s preference for raw and pure woods such as oak and beech can be considered in the context of the works of Charlotte Perriand, Pierre Chapo and Guillerme et Chambron. Packo’s unique style was also influenced by the Belgian Brutalist movement combined with an elegance and subtle modernity his often prosperous clients favoured. Special thanks to Simon Packo’s daughter for her assistance with the cataloguing and documentation. Condition: Excellent. Beautiful patina. Newly upholstered seats in Lelièvre fabric.